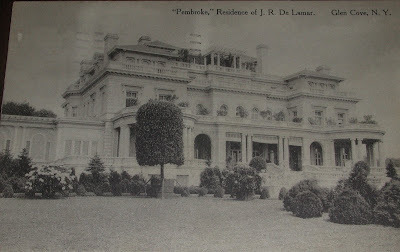 The entrance drive and main residence at Joseph R. DeLamar's 'Pembroke' in Glen Cove, designed by C.P.H. Gilbert c. 1916. 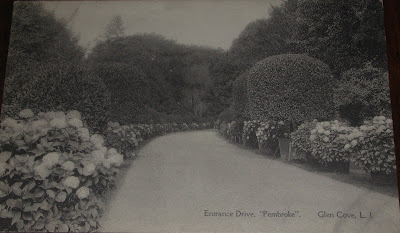 Click HERE for more on 'Pembroke' (my personal favorite). She also helped produce a book on the architecture of Addison Mizner, something I myself am thankful was actually published. She was big in boutique publishing circles and underwrote numerous publications, poems, et cetera, as well as a book about artist Paul Thevenaz, who executed murals, et cetera, for many grand folks. enthuse. That is how i learn to love them also. Would love to talk to person who worked for Alice in those later years. She was "famous" in my household & is someone I continue to find fascinating. She went to school with my grandmother. Alice De Lamar reportedly also owned a 1923 Bugatti T23, chassis no. 1646. It was a roadster and she kept it in Palm Beach. I have never seen an image of the car, but if any exist, please consider posting them here.